Rust, Austria pictures, photos. Images of the medieval town of Rust to buy on line as stock photos or photo art prints. 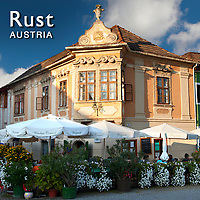 Rust (Hungarian: Ruszt, Croatian: Luzic, Ru?ta) is a city in Burgenland, Austria located at the shore of the Neusiedler See. Although it has only about 1,700 inhabitants, it is a Statutarstadt, as it was endowed with the rights of a free city by the Hungarian crown in 1681. As a Statutarstadt, it also forms its own administrative district (Bezirk). The city is famous because of its wines, especially for Beerenauslese, Eiswein and - last but not least - Ruster Ausbruch.